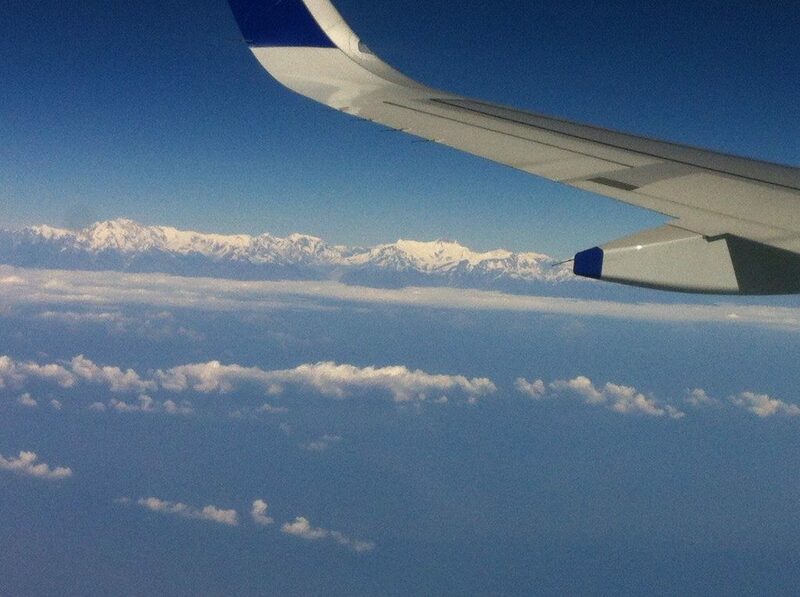 Himalayas seen while circling Kathmandu’s Tribhuvan International Airport. For some reason we were not cleared to land and went around in circles for some time, giving us a great view of the mountains. This past month, I had the pleasure of traveling to Nepal and India with my wife, mother, and mother-in-law. The portion of the trip in Nepal, was about spending time together in a place that is dear to me, as much as it was about us, spending time together as a family. I can’t remember the last time I got to spend three weeks, day in and day out, with any single person. Without anyone having to go to work/school or other obligatory engagement. So this time together, regardless of space and place, was important because we all got to spend it together. The day we were to depart from Chicago, I unplugged. I closed down my Facebook account, other social media. I did this because I genuinely needed a break from the interwebs and did so without fanfare. I wanted my focus to be on our immediate experiences and to enjoy them together, without the need to post, check-in, tag, and whatever else it is I typically do to waste time online. On the flight from Chicago to Amsterdam (where we had our first long layover), I was the lucky guest on the plane whose TV didn’t work in my sardine class seat, otherwise I would have been watching films the entire time like a normal person. Instead, I listened to some music and wrote down a few intentions/objectives for the Nepali leg of the trip while Vani and Mom chatted away like old friends. Once we finally landed in Kathmandu, we were greeted by my friend, Lhakpa Dhondrup Lama. He placed scarves around our necks and we quickly moved out of the chaotic stream of taxi drivers pushing their rides towards the van Lhakpa had arranged for us. Lhakpa was more or less quiet and calm, as usual. We drove quickly through the streets of Kathmandu. As expected, the streets did not disappoint and were full of excitement, dust, crazy honking horns, things on fire or formerly on fire, and motorcycles.. a strange experiment in controlled or uncontrolled chaos, I’m not sure which. I am and will forever be completely amazed how that the cars, motorcycles, cows, and pedestrians do not hit each other more often than not. After reaching our guest house, we got settled a bit and did the usual run out to Boudha gate to change some dollars into Nepali Rupees. This time the exchange rate was considerably advantageous for us compared to my last visit in. 98 NR to the dollar. After changing money, we walked around the magnificent Boudhanath stupa. This was Vani and Mom’s first time here. I was beaming on the inside, watching their faces react to one of the most wonderful places in the world. Letting go of expectation and control, I did my best to let them have their own experience without directing it too much with useless words of my own. Not much happened after viewing the stupa, as we only had a few hours before dark. In the evening, Vani’s own mother, Vinita, also joined us. Once she arrived, the four of us and Lhakpa would go out to dinner and call it an early night. We were all exhausted, Vani was freezing cold, and I was having trouble holding myself upright by 8pm. Here are a few photos from the start of our trip en route to Nepal.